Let nature do your decorating in the garden. Planning a garden wedding includes deciding on the perfect decorations. There are may options you can choose that are easy and elegant. If you wish to adapt an outdoor setting for a lovely wedding no matter what the season, following a detailed plan will help you create a romantic and memorable ceremony. When you plan an outdoor wedding, you can make the most of natural décor with little effort or expense if you plan your event carefully. For example, if you want a spring garden wedding, decide which spring flowers you prefer and plan your wedding at a local garden that features those blooms. While the exact appearance of certain flowers can be difficult to predict, an experienced gardener can help you select a wedding date that will coincide with the natural decorations you prefer. If you are planning an at backyard wedding in a personal garden, you have even more flexibility with natural decorations. You can select the perfect annual flowers to complement your wedding colors and nurture them carefully for the best effect. Couples with a green thumb may even want to create specialized flower beds that use different shapes, sizes, and colors of blooms to create hearts, initials, or other wedding imagery. A tiered flower bed, carefully planned and pruned, may even resemble a living wedding cake. Add color to your aisle. Groom all pathways so they are easy to walk on and nearby plants will not snag dresses or other wedding attire. Mow and trim any grassy areas one or two days before the wedding for a neat, cultivated appearance. Prune and trim all flowers and bushes in the week before the wedding, with a quick trim the day before to ensure they look their best. 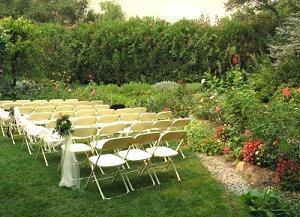 Adjust any watering schedules so that there are no puddles, drips, or soggy areas during the wedding. Discreetly position insect traps if necessary to minimize these unwelcome guests. While the beauty of a garden is a perfect subtle theme, couples interested in a coordinating theme with a bit more flair have several options. A butterfly wedding theme is a popular spring and summer choice, as are dragonfly and hummingbird themes. For a more exotic affair, consider a fairy theme, or choose one prominent type of flower or plant from the garden and use it to promote a coordinated natural theme. Couples interested in a rustic wedding may opt for hands-on themes using gardening tools, terra cotta pots, and canning jars. Match all floral arrangements, including the bridal bouquet, bridesmaid flowers, and table arrangements to the blooms in the garden to connect the surroundings with the wedding accents. Use garden-themed centerpieces such as jar vases, single stem vases, terra cotta pots, miniature bird baths, bird houses, or watering can vases. Choose a simple wedding cake with fresh flowers to coordinate with the garden and not overwhelm the theme. 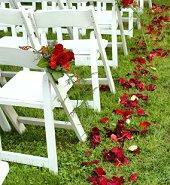 Add colored rose petals to the aisle for a dash of color, or sprinkle petals on tables for easy decorations. Add soft, romantic lighting by stringing white lights on bushes and in trees or hanging candle lanterns from nearby plants. Tiki torches are an option for a more casual event. Add multiple arches over the aisle to create a distinctive wedding space. Floral, ivy, tulle, grapevine, and Spanish moss arches are all lovely decorations for a garden wedding. Decorate all focal points of the garden, including benches, gazebos, and arches to match the wedding. Consider renting a fountain, floral planters, or multiple gazing balls to add more sophistication to the setting. Position the ceremony altar for a beautiful backdrop view during the wedding and any photo sessions. Choose appropriate garden wedding favors such as seeds or seedlings, floral scented candles, sprouting herbs, mini topiaries, or other garden accessories. Use birdseed to toss in celebration to encourage natural guests and facilitate cleanup. The season of your wedding will also impact your garden decorating ideas. Spring: Use white chairs and tablecloths for the ceremony and reception, accented with soft pastel colors and gentle fabrics. Tulips, buttercups, and daisies are favorite spring flowers. 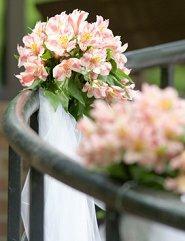 Be sure to have an indoor plan if unpredictable spring weather interferes with wedding plans. Summer: Use wicker or white chairs and bolder colors to accent the season's brilliance. Fresh berries, citrus fruits, roses, and other vibrant accents are perfect for summer. Provide tents or other shade to keep guests comfortable in the summer heat. Autumn: Use darker woods and richer colors to emphasize the beauty of the changing season. More rustic accents work well for fall weddings, including pumpkins and colorful leaves. Evenings can be chilly, so be prepared for cooler temperatures. Decorations for a garden wedding can be stunning, but take care not to overdo your additions to nature's beauty. A sophisticated theme that blends well with the surroundings will be both beautiful and easy to coordinate, making your wedding day a fantasy of garden elegance.